I know. It isn’t Wednesday. But I’ve a good reason for posting early, as you’ll discover on Wednesday. To tie in with my look at Adnams beers after WW II, I’ve decided to publish recipes, too. Starting at the same place, DS Stout. It’s typical of a certain type of post-war English Stout. A kind of beer everyone seems to have forgotten about. A gravity of 1040-45, 65-70% attenuation, a bit under 4% ABV. Too strong and too highly-attenuated to be a Sweet Stout, but less attenuated than Guinness. I’ve dozens of examples. Though as the 1950’s progressed, some did turn sweeter. Presumably to put a clear distance between them and Guinness. Or simply because there was a demand for Sweet Stout. I was intrigued to see that in the 1920’s the attenuation of Stouts had been greater – mostly over 70%. I think I know the reason why it had fallen by 1950. They were deliberately leaving the FG high to give the beer some body, albeit at the expense of ABV. Moving on to the beer itself, the grist is a combination of four malts: mild, chocolate, amber and crystal. I can’t recall seeing that mix before. Most breweries had ditched amber malt before chocolate malt became very common. 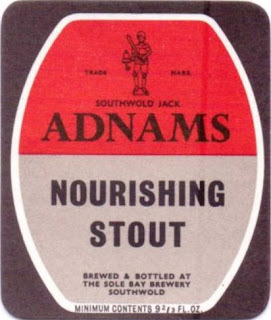 Looking through some older Adnams records I noticed that they switched from black to chocolate malt quite early, back in 1914. For the simple reason of that juxtaposition of malts, I’d love to try this beer. The hopping is total guesswork. All I know for certain is that the hops were English. But as Fuggles accounted for around 75% of the British crop at this date, choosing Fuggles seems pretty safe. Especially as most of the other 25% were Goldings and you wouldn’t usually use those in a Stout. They were meant for Pale Ales and other posh beers. It looks as if a fair bit of the colour comes from caramel so it may come out a little pale if you don’t use any. That’s all I can think of to say. So over to me with my other hat on . . . . .
"It looks as if a fair bit of the colour comes from caramel so it may come out a little pale if you don’t use any." I don't know Ron - over 22% of the grain bill is coloured malt, which should give you a decent black beer, and the caramel content is, if anything, a bit on the low side, I would have said. I think the name of this beer is the clue: aimed at people who had taken on board the idea that stout was a "healthy" drink, and drank it for that reason, but who found sweet stouts too sweet and who couldn't afford Guinness (which, I'm prepared to bet, was a couple of pence dearer).